Everyone knew Fenway Sports Group, Liverpool's owners have spent far less money to sign players in the past and they kept the tradition alive in this transfer window as well. 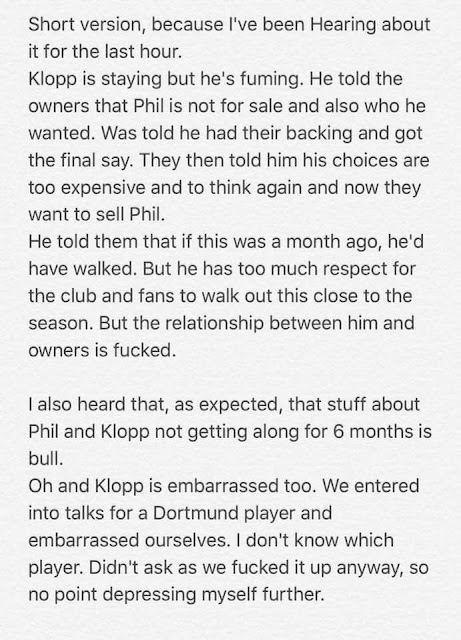 Now, when Coutinho to Barcelona is getting closer, Klopp issued a statement of keeping Coutinho. But yesterday, in his Post Watford press conference, Klopp said he had bosses too. He seemed like he didn't have the authority over transfers anymore. He further said that Coutinho's transfer was out of his hands. It is in the owners' hands to sell or keep him. While this news was headlining the papers, another piece of text is circulating around the Reds' fan base. 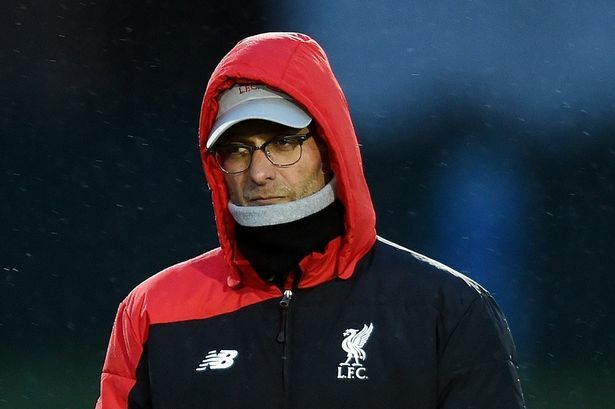 The writer says that Jurgen Klopp would have resigned if the Coutinho transfer request had happened a month ago. 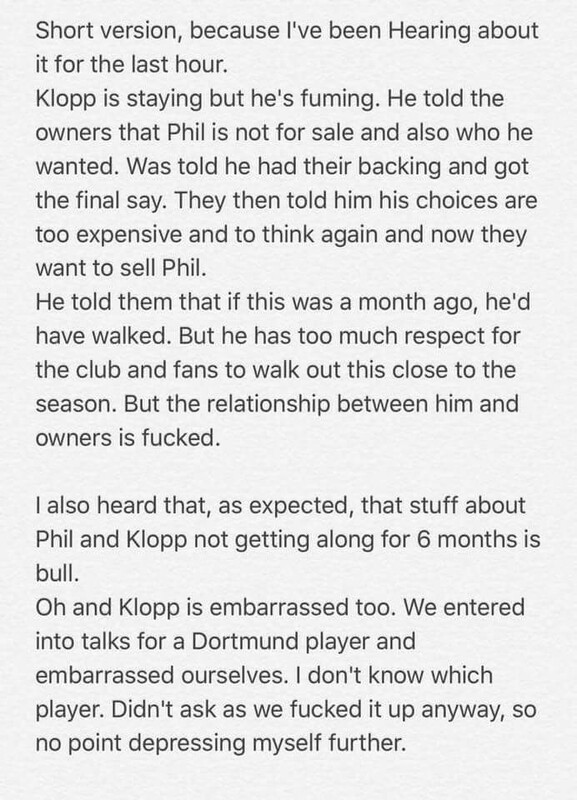 The owners' reluctance to first not sell him, and then suddenly changing their mind about it while also telling Jurgen Klopp that his transfer targets were too expensive and not in their pockets when their pockets were deep with money and revenue. The club is now very stable as far as money is concerned. The club has spent least money of any top 7 clubs since 2012/13 in which Manchester City, United and Chelsea top the rankings with 700m plus spent while net spend of Liverpool being 107m. The difference of the performances and trophies won tells on the pitch in which we have not won any trophy and City, United and Chelsea all have won the Premier League title from 2012. Getting to finals alone is not enough, winning them is. That is the thing our owners have thus far failed to understand. Liverpool Football Club is one of the biggest brand and attractions in Global Football, and it needs ambitious ownership. The manager is ambitious, fans are ambitious. Every season, everyone sets their eyes on the Premier league but we fall short. Sometimes, expectancy might be too much, but this transfer window seems reminiscent of the 14/15 Summer transfer window in which Raheem Sterling's transfer saga took it's toll on the team and players like Mario Balotelli, who is good but didn't suit the club at all. Fenway Sports Group needs to be ambitious. Money ball like Boston Red Sox might work there, but it's not working here. For it to work, you need a world class scouting system. Monaco is an example. They keep selling their best while improving each season. So, the owners of this great Football Club need to think positively and accept that in today's market, there are no bargains of 5-10m players. That time has long but gone. We, as Liverpool fans hope that we sign good players in the final weeks of the window, and have a trophy-full season.